The Dunwoody Wildcats are headed to the Class 6A state championship! 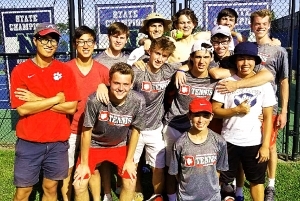 A trip to the Class 6A Boys Tennis Championship was on the line Thursday as the Dunwoody Wildcats faced off with Region 7-6A foe Northview on the road in the Final Four. Dunwoody entered as the No. 3 seed from the region while Northview had earned the No. 2 seed. Coach Charles Meador’s Wildcats earned that trip to the championship round with a decisive 3-1 win on Northview’s home courts. Junior Cole Brainard got a point on the board with a 6-3, 6-4 victory at No. 1 singles. The No. 1 doubles duo of senior Matthew Moussouri and freshman Quinn Wicklund had a close first set win of 7-5 but cruised to a 6-1 victory to make it a 2-1 Dunwoody advantage. Junior Cade Lautenbacher closed out the big victory with a three-set match at No. 2 singles Lautenbacher won 6-2, 5-7, 6-2 as the Wildcats would begin to celebrate their trip to the Class 6A title match. It is the Wildcats second state championship appearance as a team and the first since 2006 when they dropped a 3-0 decision to Westminster in the Class AAA title match. Dunwoody (15-7) takes on another Region 7-6A opponent in the finals as they face No. 1 seed Johns Creek (17-2) which defeated the Wildcats twice this spring, including 5-0 in the regular season and 3-0 in the Region 7-6A semifinals. Johns Creek defeated Centennial 4-0 in the all-Region 7-6A state semifinals. The Wildcats are 0-2 against Johns Creek in the state playoffs including losses in the 2011 Sweet 16 and 2012 Elite 8.